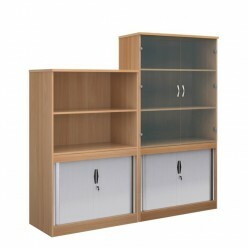 Combination Tambour unit with choice of glass doors or open top. Our Combination Tambour unit is manufactured from high quality MFC and benefits from an 18mm frame with 25mm top. 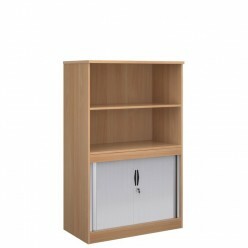 Comes with lockable sliding tambour doors. We offer a choice of cupboard sizes and finishes. Additional fitments for system storage are available. Doors at the top are also available with toughened security glass.